Those very words can be found in my profile, and I’ve yet to write anything about baking on The Dainty Dot. This is, after all, the Year of Ellen Baking. As a comparison, 2010 was the Year of Ellen Sleeping and 2009 was the Year of Ellen Not Sending Cards. I decided to put a more positive spin on the “Year ofs” during this turn around the sun. Am I baking today? No. This week? Probably not. Blame it on a preparation for a business trip/presentations coming up in a few days. But don’t you fear – I’ll be baking (said with a slight Arnold Schwarzenegger/Terminator affect). Coincidentally, I heard a buzz that 2011 will be the year of the pie. Sweet pies, savory pies, hand pies, round, square, pan—you put a crust of any sort on it, in it, around it, call it a pie and it’s a rock star this year. And, not to steal Martha’s catch phrase but … that is a good thing. Because Ellen bakes pies. Always have. Pie crust is an amazing canvas. And really, I’m fixated on perfecting that canvas. I’ve in no way come even half way to making a top-notch crust, but I love the challenge. Fillings? Yeah, ok – it’s the stuff of the pie. But I always remember the crust. Best pie crust ever is my mom’s crust from my childhood. The flakiest ever, thanks to lard. Rendered from our own pigs. Didn’t mean to skeeve you out but when you grow up on a farm you can expect that sort of thing. Alas, no more lard for mom and dad. Doctors orders. The loveliest pie combination: Peach-rhubarb, also from fruit grown right on the property. “Peaches? Rhubarb? How are they ever in season at the same time?,” you ask. They aren’t. But as the peaches come on, along with every other fruit and veg roundabout August, and you’re looking for room to store stuff in the chest freezer, you spot the frozen rhubarb. 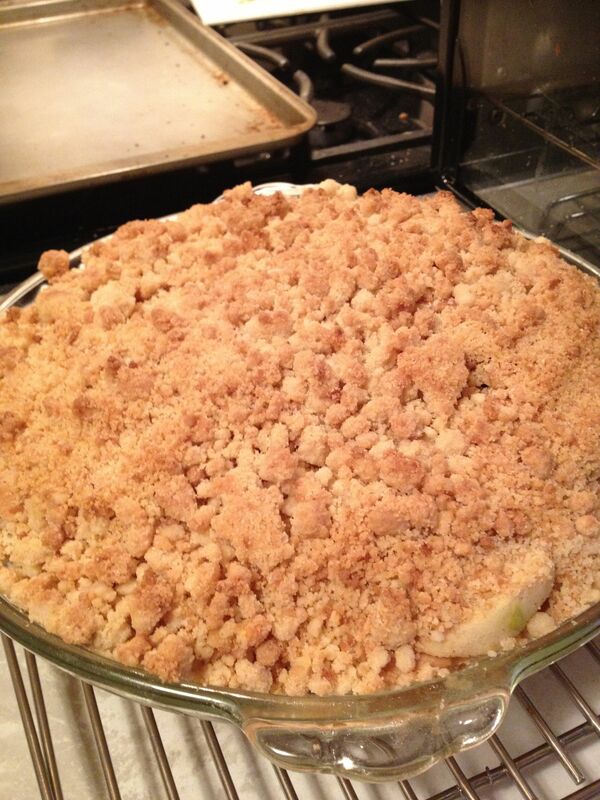 “Hmmmm … let’s make a pie,” is the natural solution. Down the block from me is a bakery that is pretty well known – Flour Bakery + Cafe, run by baking’s “It Girl,” Joanne Chang. Awesome place. the line is pretty much always out the door – which is why I don’t really go there too very often. But when I do, it’s oh so good. Okay, folks – I gotta go get a move-on with that presentation. 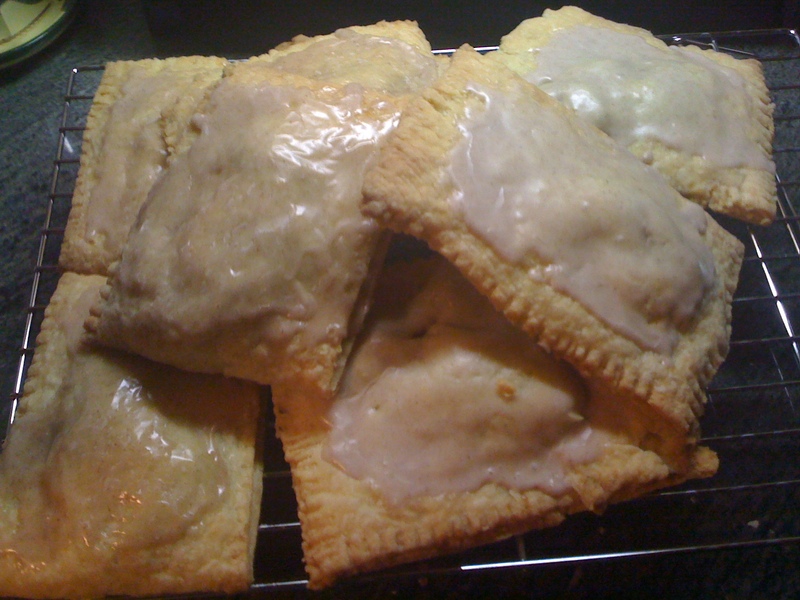 But, let me leave you with a drool-inducing image of my apple cinnamon pop-tarts baked word for word (almost) from the Flour cookbook. Yum …. You are currently browsing entries tagged with pie at The Dainty Dot.